The following is an expanded version of an article that appeared in the 2010 RHS Bulletin. 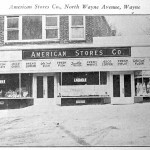 Since the first half of the 20th century, Acme and American Stores Co. markets have been fixtures in downtown Wayne. 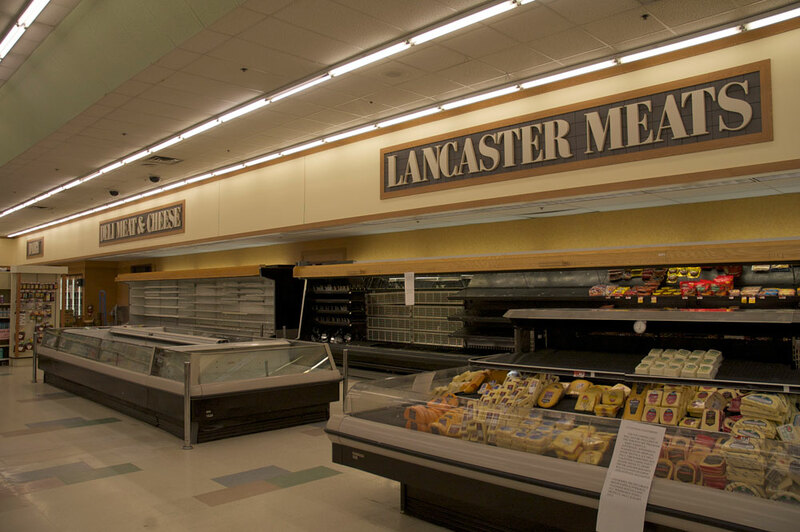 As 2010 marks the 40th anniversary of the current Acme at Lancaster Avenue and N. Aberdeen Avenue, and the final full year of its operation, this is a good time to look back at the history of these markets in Wayne. 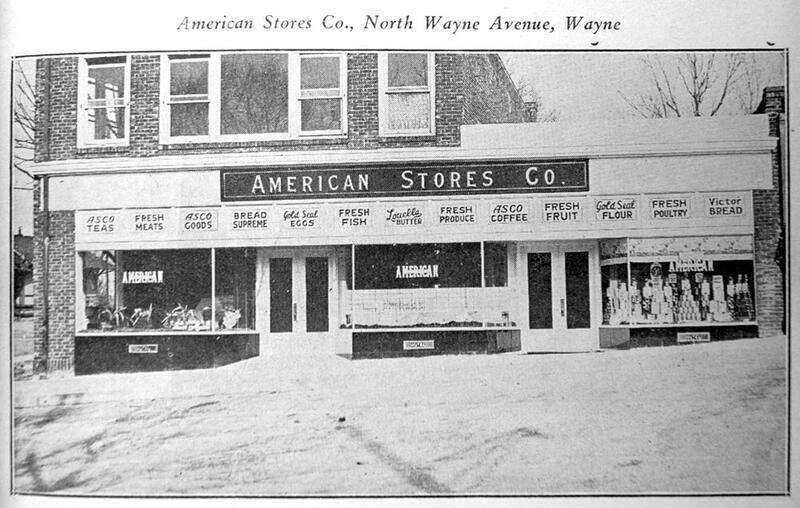 The story of Acme stores in Wayne begins with that brand’s predecessor, American Stores Co., and their location at 131-133 North Wayne Avenue. 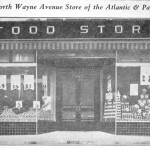 It is unknown when this corner grocery store opened, but a photograph of the store appeared in the April 13, 1934 issue of the Suburban and Wayne Times. 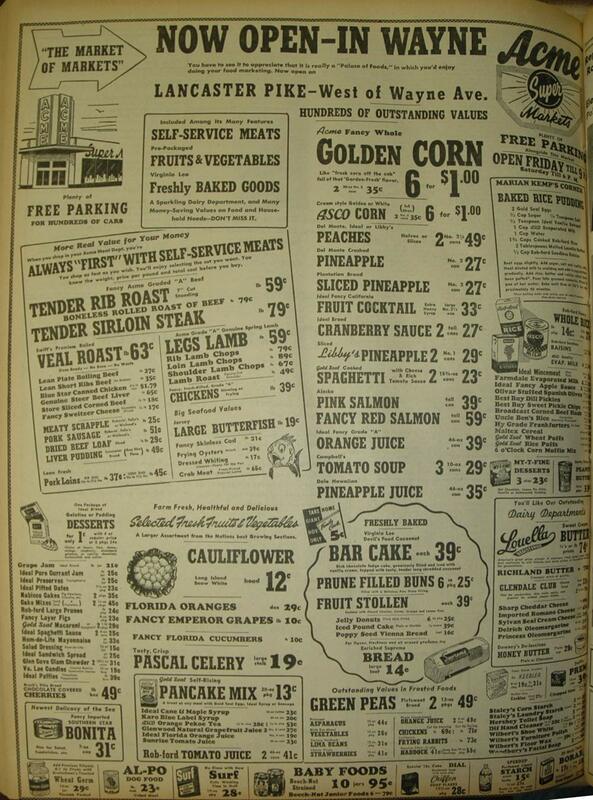 Interestingly, an A&P store opened in 1936 at 125-129 North Wayne Avenue, right next door, as photographed in the October 2, 1936 Suburban. 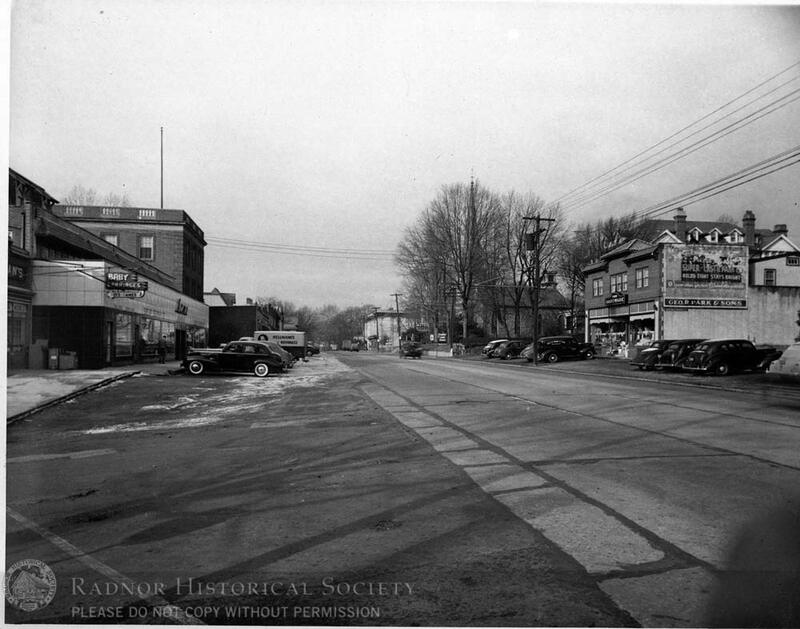 Today each market has been divided into two storefronts; the A&P is now Troubadour Music and Wayne Vision, and the American Stores Co. is now Elegance Cafe and The Pear Tree. 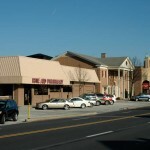 The North Wayne Avenue location was a typical corner store designed for pedestrians, with quick access from the train station and the neighborhood of North Wayne. 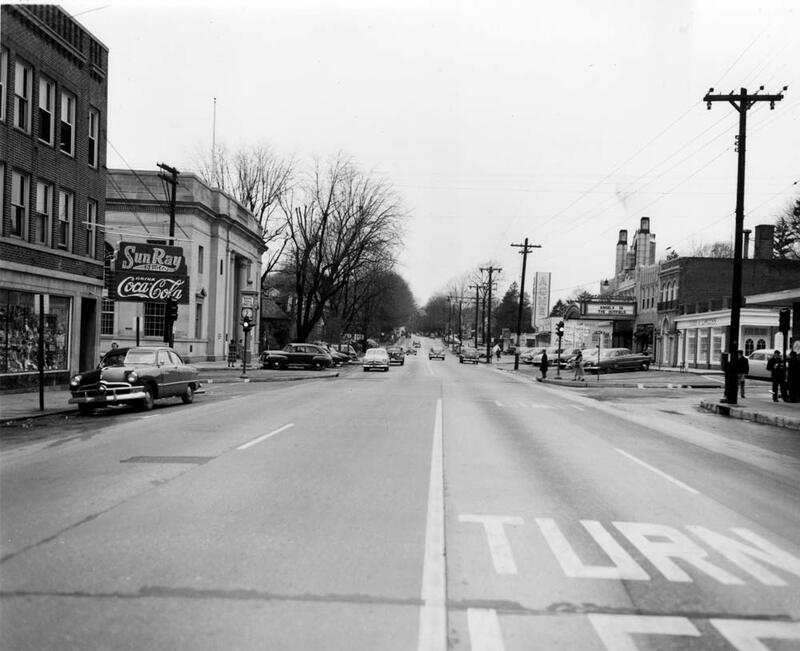 At the time the avenue was full of small stores, but it lacked adequate parking and was off of the major commercial corridor of Lancaster Avenue. 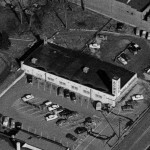 In the late 1930s, the company decided to invest in supermarkets rather than corner stores, and while the North Wayne Avenue store remained open, a new Acme market (one of the first to be given that name) came to Wayne at 154-156 E. Lancaster Avenue, on the south side of that thoroughfare at the corner of Louella Avenue. 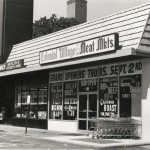 This modern, streamlined new store opened for business on October 27, 1939. (Fry) The wide new façade was likely the result of combining a row of individual storefronts, each with an apartment above. 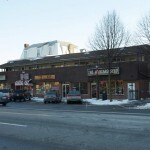 This row of stores had previously been built around an even older building, an 1880s house with mansard roof originally owned by J.C. Pinkerton. 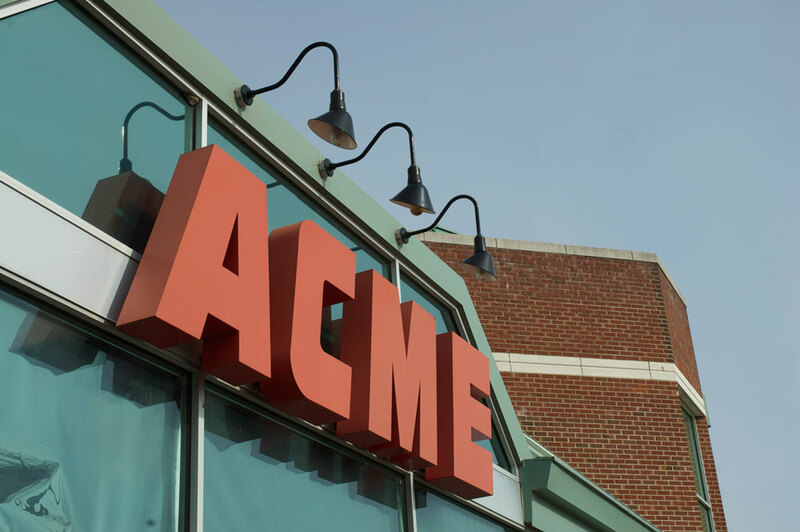 A new overhanging façade was added to the row of storefronts, faced with Acme’s new standard architecture of white panels and a blue script logo. The words “Self Service” were prominent on either side of the large centered logo. 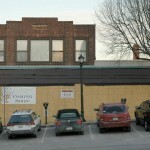 The store’s immediate neighbors were an F.W. Woolworth Co. store a few doors to the west, a Bell Telephone office building to the immediate west, and St. Mary’s Episcopal Church across Louella Avenue to the east. 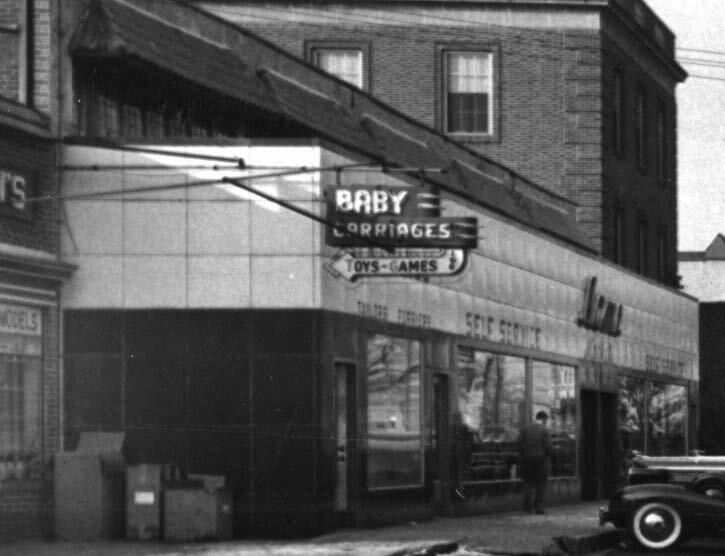 La France Tailors & Furriers operated underneath the east end of the Acme’s white porcelain-paneled façade. 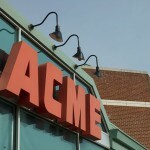 A close-up of the Acme store from the left photo. 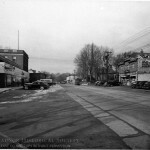 The 1939 Lancaster Avenue store was much larger than the North Wayne Avenue store, but only street parking was available. 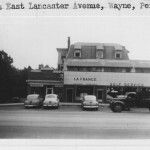 On November 2, 1949, a new Wayne Acme opened at 127 West Lancaster Avenue after three months of construction. 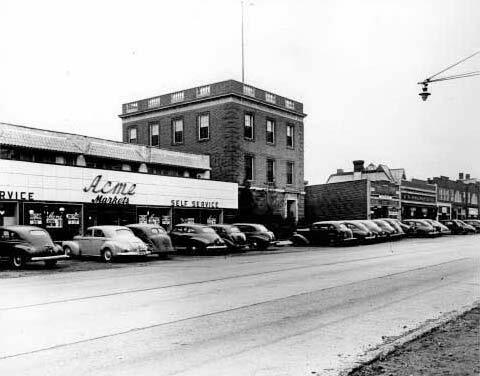 The new store supplanted both the American Stores Co. on North Wayne Avenue and the 1939 store further east on the Pike, cementing Acme’s place in the growing supermarket business. 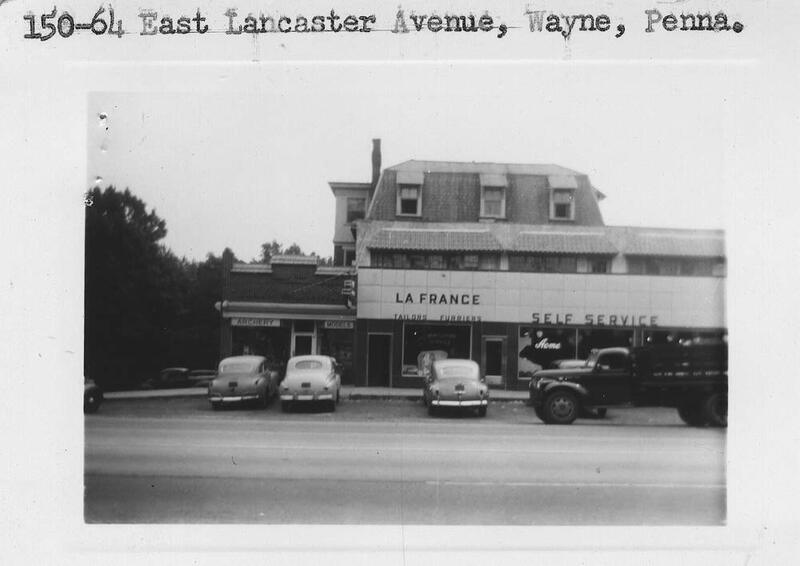 (Fry) As a result the North Wayne Avenue storefront was divided into two stores, and the 154-156 E. Lancaster store became the Lancaster County Farmer’s Market. 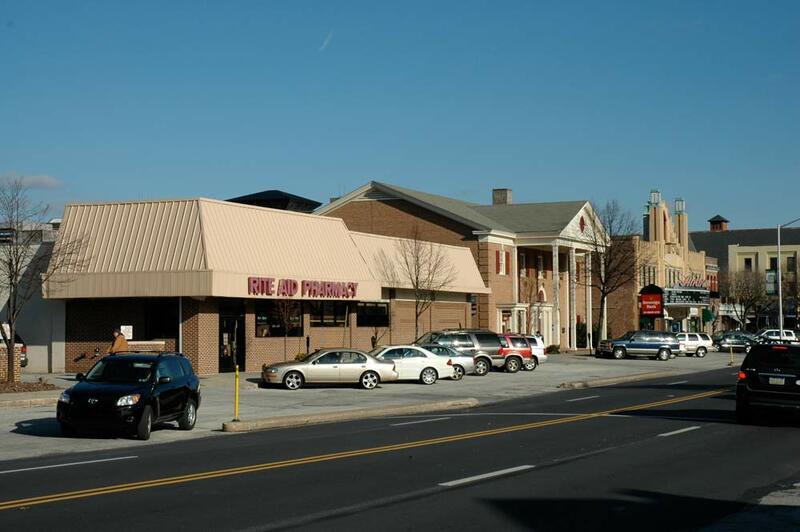 This market was a draw to downtown Wayne for many years, until it moved into a larger building on Lancaster Avenue and Eagle Road. 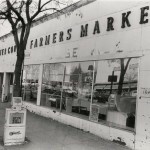 The exterior of the store, 150 feet wide, was clad in white enamel panels and blue script logo. This cursive script was in contrast to the large sans-serif “ACME” letters found on the rectangular tower at the building’s southwest corner. This hard-to-miss tower was a common feature on Acme stores of the time. 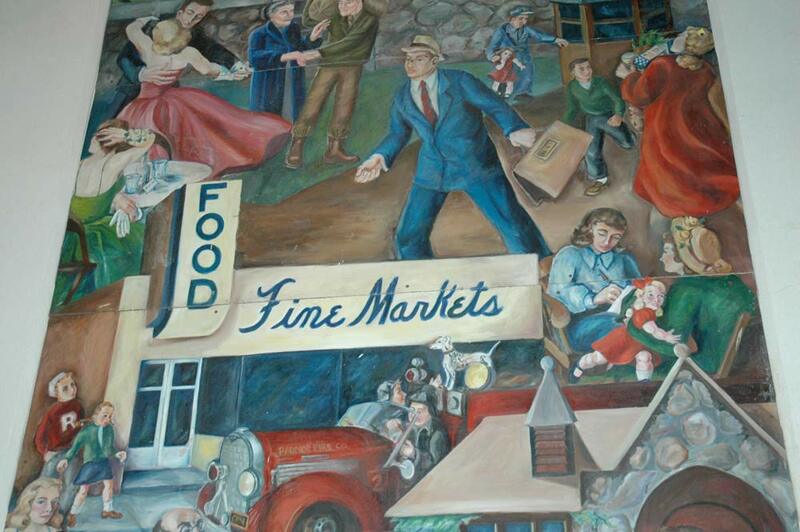 The Acme building was immortalized on the 1950 mural of the Radnor High School auditorium, as part of a panel depicting the Wayne of the “present.” The “Acme” name cleverly replaced with “food,” the distinctive building is easily recognizable. 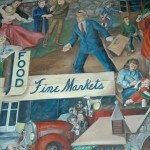 The mural remained in place for 57 years, long after the school’s conversion to Radnor Middle School, and was removed when the building was demolished in 2007. 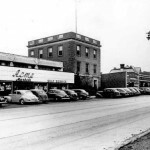 The new store, continuing the trend, had even more parking to meet the demand of the automobile’s growing influence, and a larger building that eventually housed a separate drug store on its east end. 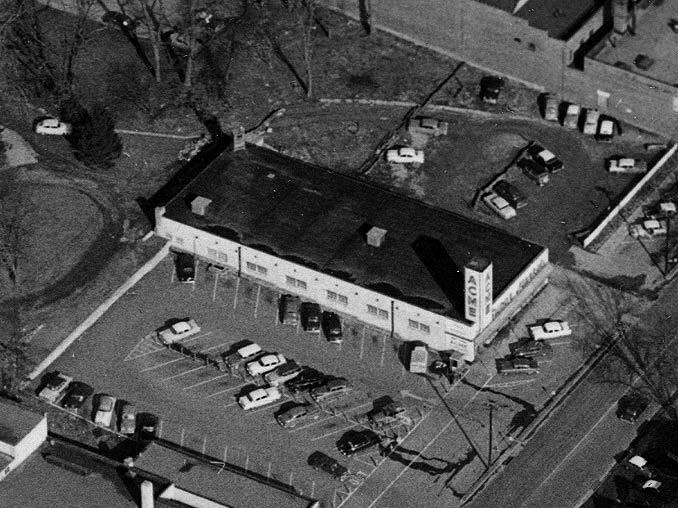 This new Acme opened on Feburary 4, 1970 (Fry). 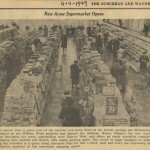 As a result, Wayne’s 1949 Acme closed after more then 20 years of operation; the building was split into two, at one time housing a Rite Aid drug store on the west side and the Colonial Village Meat Market on the east. Rite Aid would eventually take over the entire building. 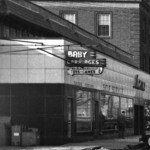 The large square tower remained long after the departure of Acme, painted a darker color and eventually outfitted with a lighted Rite Aid logo. 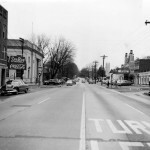 For 41 years, the 1970 Acme serviced the town, and was an important commodity to residents, especially those in neighboring apartment complexes. 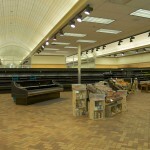 The store received a major renovation in the 1990s, with the addition of sloping green metal pyramidal roofs common to Acmes of the time. 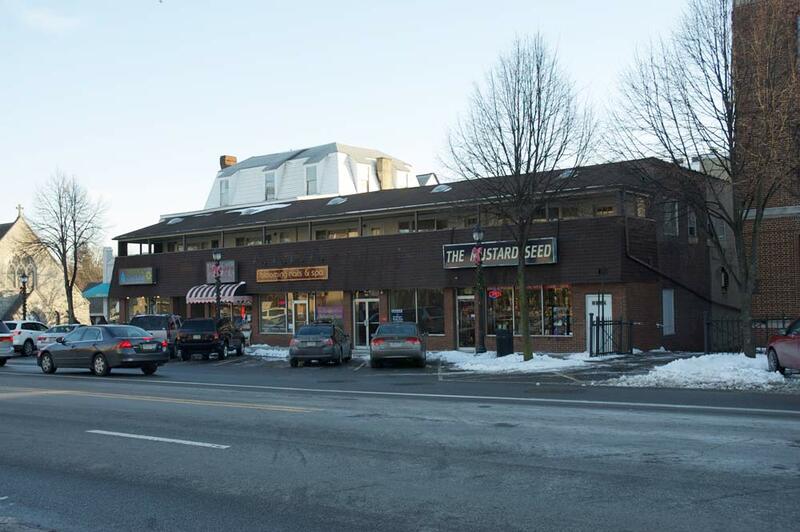 The adjoining drug store (which had various operators including a Rite Aid) vacated the space in the 2000s, and in 2009-10 that portion of the building was remodeled to accommodate two restaurant spaces. 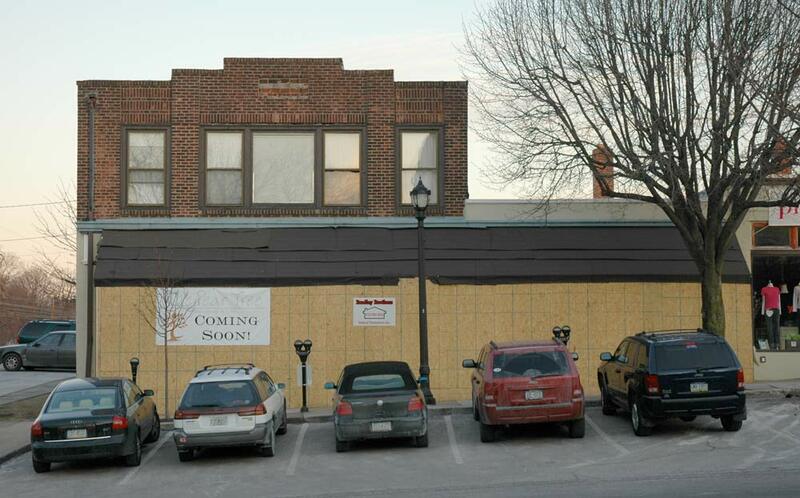 In 2010 Anthony’s Coal Fired Pizza, a Florida-based chain, opened one of its first stores in the Northeastern United States in one half, and a Chipotle Mexican Grill opened in the other. 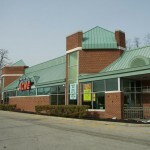 The Acme closed in February, 2011, and its space will be converted to a group of smaller stores and restaurants, rumored to include Five Guys, Panera Bread, Five Below and City Sports. 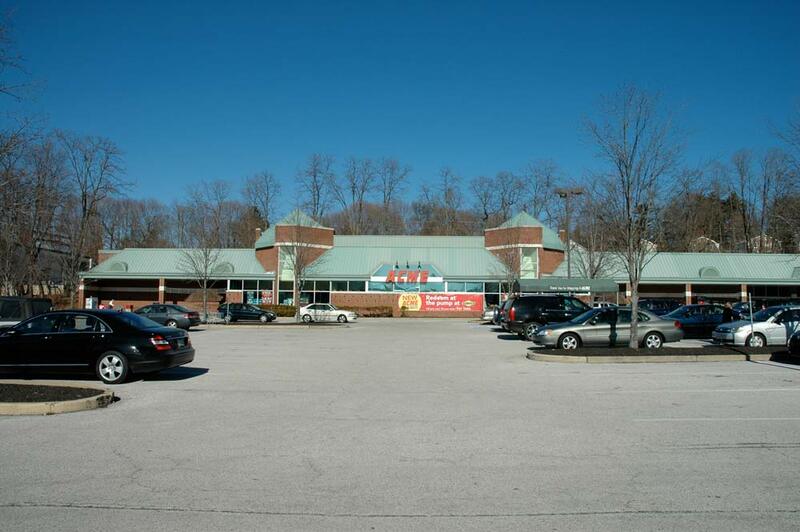 The area will still have an Acme within close proximity; the Devon Acme, just over the Tredyffrin Township line. A Pantry Pride store until 1980, this store was heavily renovated within the last few years and is likely to remain open for years to come. 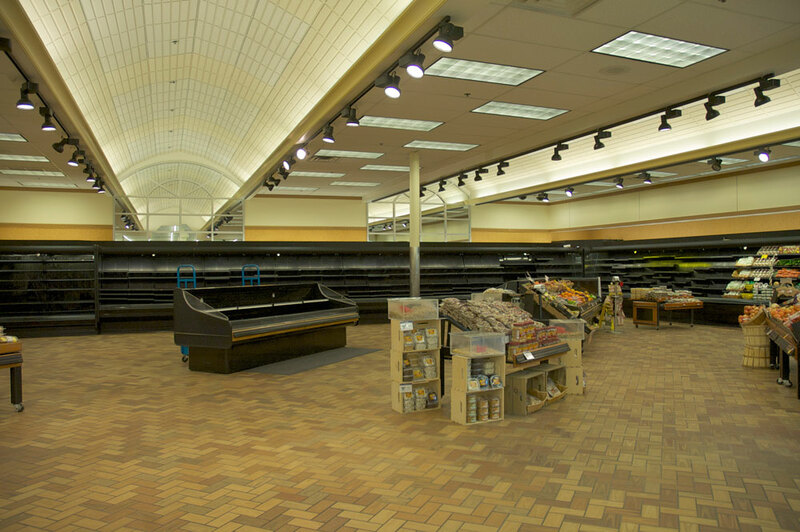 Genaurdi’s in St. Davids is now the only large grocery store in Radnor Township. 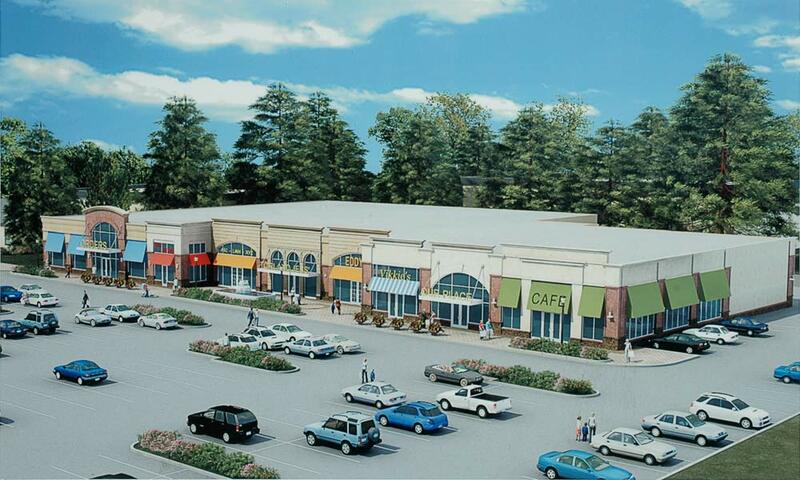 A sign featuring this rendering on the site shows the “Wayne Square” concept, eliminating the Acme for a row of smaller stores. 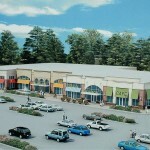 This would turn the property into more of a strip mall instead of a supermarket-focused center. 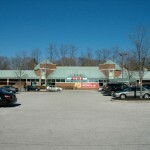 Unusually close to the Wayne Acme is the Devon Acme at Tredyffrin Township’s border with Radnor. 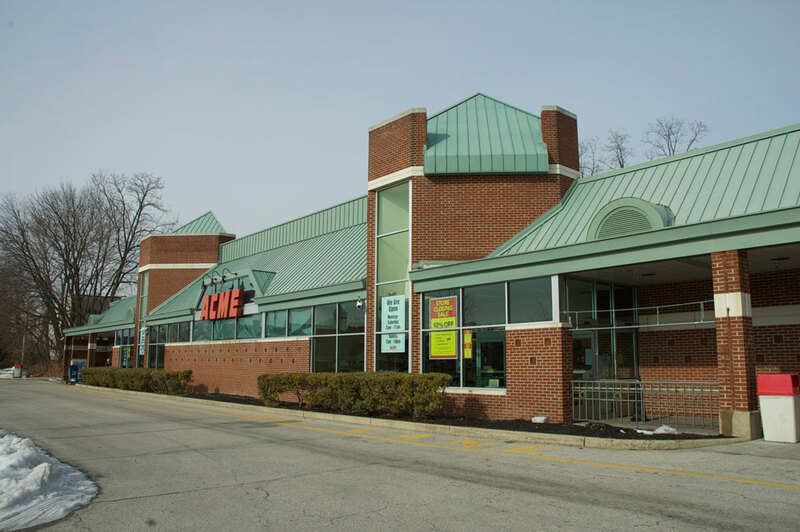 This Acme, built on the site of the former Main Line Drive-In movie theater, was originally a Pantry Pride store, and the adjoining K-Mart was originally a J.M. Fields. 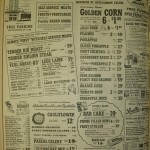 Both chains were operated by Food Fair, which went bankrupt and was bought by Acme in 1978. 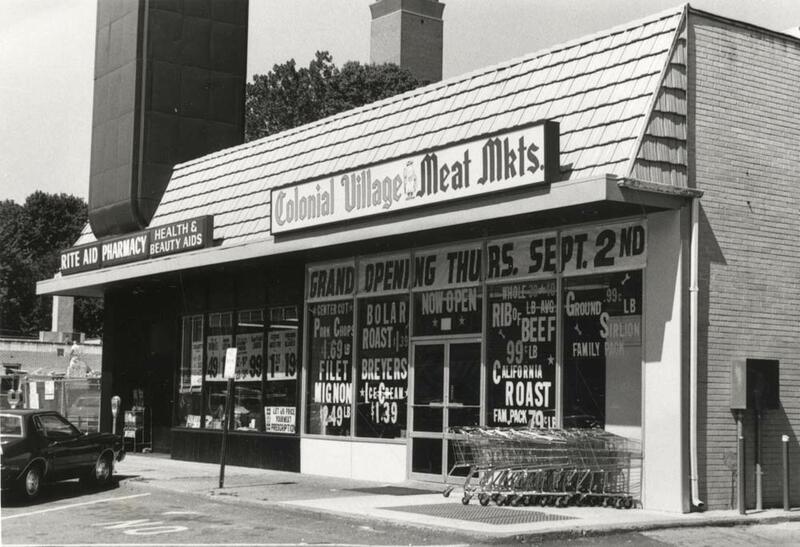 The supermarket reopened as an Acme after renovations on August 24, 1980. 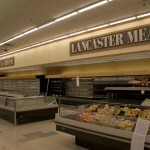 The K-Mart is remarkable for retaining its distinctive J.M. 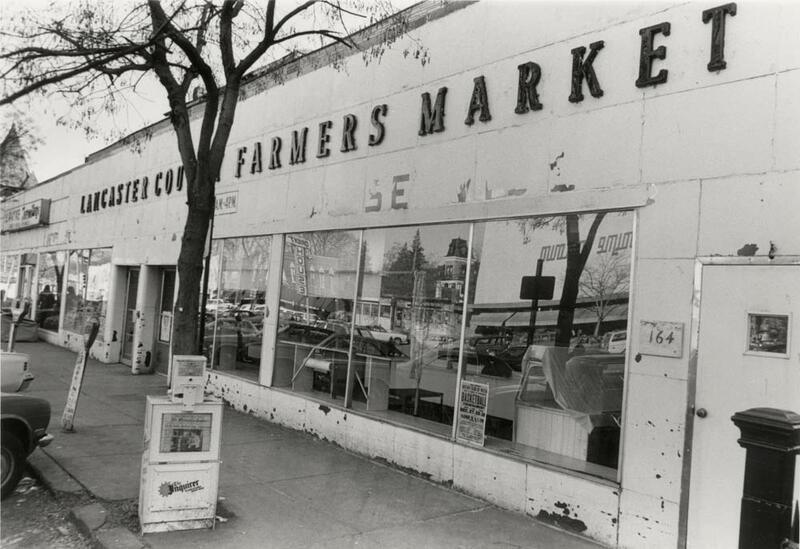 Fields façade to this day, despite heavy renovations to the Acme store in the 2000s. Fry, C. Herbert. “‘The House that Quality Built’ : A Brief History of the American Stores Company.” Tredyffrin Easttown History Club History Quarterly, April 1991, 43-64. 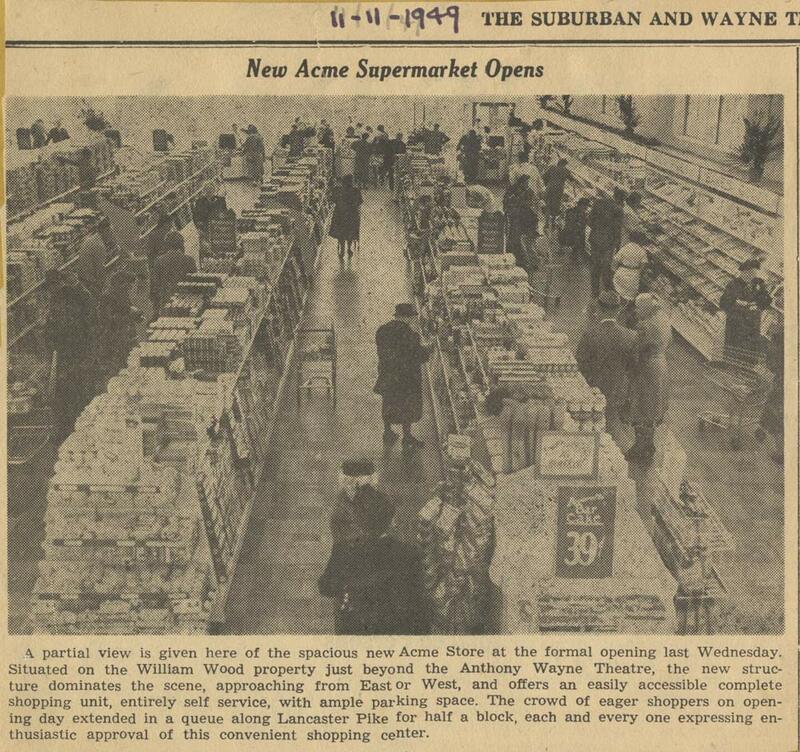 “Acme Supermarket Opens; Has Many Aids for Shoppers.” The Suburban & Wayne Times, November 4, 1949.